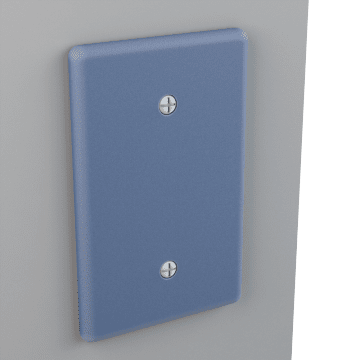 Install blank wall plates on unused electrical boxes to prevent accidental contact with terminated wiring connections inside the box and protect the connections from damage. The plates don't have cutouts for switches or outlets, so they can be used to cover empty boxes for a neat appearance. They cover the open face of an electrical box that is recessed into a wall and can be removed when you want to install a receptacle or switch or run wires in the box. Attach the plate to the box using screws.